The meteorology community is in mourning today in the wake of the deaths of three professional storm chasers. In yet another deadly night of storms, Tim Samaras, his son Paul Samaras, and Carl Young were among the at least nine killed Friday night in Oklahoma. Their vehicle was thrown so hard it was crushed beyond recognition. The tornado was estimated to be an EF-3 with winds between 136 and 165 mph. You may remember Tim from the Discovery Channel show Storm Chasers. He also started TWISTEX, an experimental program aimed at getting data from tornadoes by dropping probes in their path. The information gleaned from these probes helps meteorologists and emergency management agencies warn the public of approaching danger with longer lead-times. Tim, Paul, and Carl will be deeply missed. 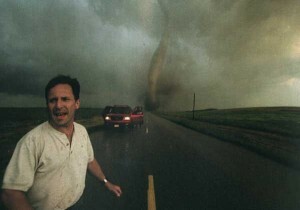 Tim Samaras and two other members of his TWISTEX team were killed by a tornado near El Reno, OK on Friday night. I want to stress the importance of the work professional storm chasers do. These are not simply adrenaline junkies looking for a video and their 15 seconds of internet fame. Their work collects real data which is used in an effort to protect the public. Even a five-minute difference in lead time can save plenty of lives. The large wedge tornado that took the lives of the TWISTEX team was particularly dangerous because it was rain-wrapped. Usually a tornado will be surrounded by clear air, making it highly visible. This one was surrounded by heavy rain, making it more difficult to get a visual fix on. Combined with an unexpected turn it took, the twister was especially deadly. It is just another reminder of how much we still have to learn about tornadoes. 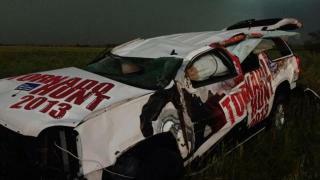 Incredibly, the TWISTEX team were not the only chasing team that took a deadly hit from this tornado. Mike Bettes (@TWCMikeBettes) and a team from The Weather Channel were in their chase vehicle (an SUV) when the tornado picked up their vehicle and through it 200 yards. Thankfully, everyone inside walked away. The wreckage of the Weather Channel chase vehicle. In other news, Hurricane Season has begun and the Gulf is already active. A disorganized system east of the Yucatan has a low chance of becoming a tropical system but is giving us something to watch in the next couple days. As I did last year, I’d like to plug Mike’s Weather Page to anyone interested in tracking hurricanes.